Page High School celebrated Star Spangled Banner Day this past week, displaying a huge replica of the historic flag, celebrating veterans, and displaying a governor’s proclamation of the observance state wide. The Brentwood-based Crockett’s Forge Seat Chapter National Society United States Daughters of 1812 sponsored the Star-Spangled Banner Day Celebration at Page. On Sept. 9, 2016, State Rep. Glen Casada presented a state resolution that was passed by the legislature and signed by Gov. Bill Haslam proclaiming Sept. 14, 2016 to be celebrated across the State of Tennessee as Spar-Spangled Banner Day. 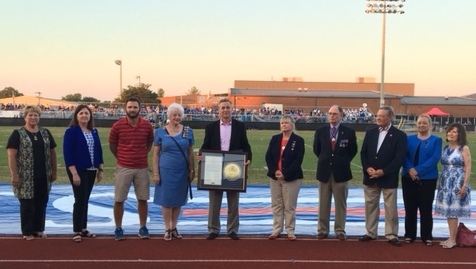 Dr. Shane Pantall, Page’s principal, accepted the proclamation so it may be displayed at Page High School, home of the Patriots, for all to see and remember. National Society United States Daughters of 1812 State President Linda Tripp, David Eagan (General Society War of 1812 National District Deputy President General), Emily Townes (President Crockett’s Forge Seat Chapter USD 1812), and Crockett’s Forge Seat Chapter members, were present at Page for the event. Francis Scott Key wrote the Star Spangled Banner as a poem on Sept. 13, 1814. It was set to music and became the National Anthem in 1931.